So you have an FC RX-7 and you want to upgrade the car both in engine performance and styling. We have a large range of CorkSport brand products to help you out, along with other products we carry. Today we’ll start with the engine performance modifications, and later on work our way to the exterior. The example car I will use for the build is my 1987 RX-7 Turbo II, since I am very familiar with it. This build will be written as if the car is stock when we start the project. 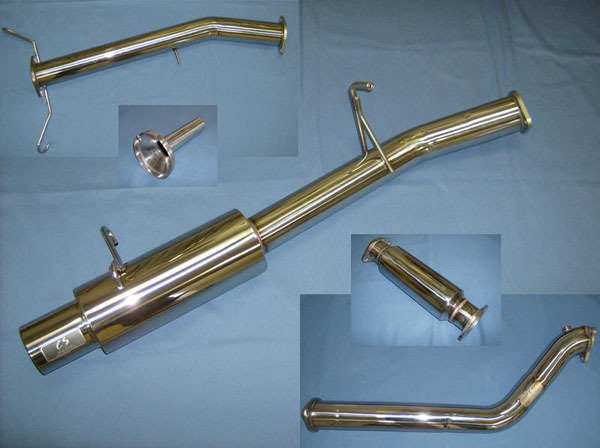 The first thing you need to do is get rid of the stock exhaust since it is heavy and fairly restrictive. Since my car is a turbo model I chose the CorkSport 80mm Turbo Back Exhaust or TBE for short. There are several reasons to go with the turbo back system. First, the exhaust looks great and sounds even better. Second, the turbo back exhaust is straight-through and is as free-flowing as you can get (be careful, removing the catalytic converter can violate emissions laws, check your local laws before installing.) Third, the amount of power gained with the exhaust system can be close to 45 wheel horsepower. With the installation of the exhaust you do need to defeat the over-boost safety device built into the stock computer. This can be done with an HKS Fuel Cut Defender (FCD). What it does is cap the voltage of the pressure sensor so the computer does not think it is boosting higher than stock. Without the FCD the factory computer will cut fuel to the rear engine rotor to try and control what it thinks is over boost. The fuel cut will cause the rear rotor to be lean and can result in detonation and engine damage. With the increase in power and boost from the TBE we need to look at addressing the fuel system before we put anymore power out of the engine. Lets face it, the fuel pump has been in the tank for 24 years now and isn’t getting any younger. To keep supporting the power increases an upgraded fuel pump is going to be required. The two options CorkSport offers are the J-Spec Cosmo fuel pump and the Walbro 255lph pump and Screen kit. I personally would use the J-Spec Cosmo pump. It may be more expensive but it was designed to fuel the 20B 3 rotor engine which had six 550cc fuel injectors to feed, which is 1100cc more than the FC RX-7 Turbo has. The pump is a bolt in replacement for the stock fuel pump and it includes a new pickup screen. I also strongly recommend sending your fuel injectors out to be tested and cleaned when you upgrade the fuel pump. There is most likely 24 years of deposits built up in the injectors as well. There are several companies which offer the service, like Witchhunter Performance or Marren for example. Find a place to clean the injectors that is close to you to cut down on shipping time back and forth. With the fuel injectors pulled out I am sure you noticed that the wiring harness is pretty crunchy and destroyed, especially on the turbocharger side of the engine. The options are to either fix the breaking connectors and splice in new plugs or replace the harness. I would opt for replacing the harness myself so there will be trouble free motoring in the future. The CorkSport Harness is a great setup with all of the short comings of the stock harness addressed and removed in this new part. We improved the exhaust flow so now it’s time to go work on the intake side. The first part to remove is the stock rubber turbo inlet pipe, which undoubtedly needs attention. The heat from the turbo and time really play hell with the stock part, making it brittle and prone to cracking. The CorkSport Turbo Inlet Pipe or TIP for short gives you a good looking part which will last much longer and seal better than the stock rubber part. The CorkSport TIP also happens to be $60 less than the stock Mazda part, if you can even find one. The second part to the intake side is adding the CorkSport Front Mount Intercooler Kit (FMIC). The stock intercooler is mounted on top of the engine and can get heat soaked easily. 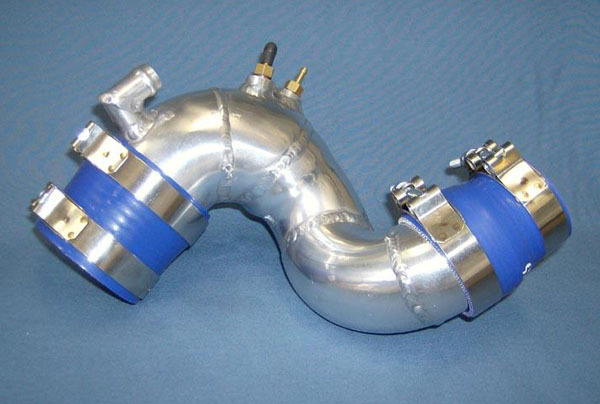 For more information on heat soak check out our technical article about upgraded intercoolers. The solution to this is to get the intercooler out of the engine bay and into the air flow of the cooler air coming into the engine bay. The intercooler really helps out with making power consistently, instead of worrying about performance variations because of intercooler temperatures. With a heat soaked stock intercooler you get almost none of the cooling effects and you are just pumping hot air into the engine. Now that we’ve done a good job of upgrading the power potential of our car, we need to make sure it stays cool. The next item to upgrade then is the old stock radiator in the RX-7, and we have the perfect part or the job. The CorkSport Aluminum Radiator and Fan Shroud are bolt in replacements for the stock radiator and shroud. The reason the new shroud is required is that the thicker radiator places the shroud closer to the stock engine fan. The new fan shroud has extra clearance so the stock fan can still be utilized with the upgraded radiator. The original radiator uses an aluminum core with a plastic fiber end tank design. After heat cycling for 24 years the fiber end tanks get brittle and crack. When this happens it is game over for the stock radiator and your engine if you let the engine overheat. Remember if you hear that annoying buzzer go off, stop your car and check the coolant (let it cool off first). Mazda made it annoying on purpose; rotaries do not handle overheating well. While we are on the topic of cooling, the stock oil cooler lines are something to look at. The stock parts are a rubber line with a braided cloth outer. The lines will get soft and start to develop leaks or possibly fail over time. This can be the end of your engine if this happens while you are driving and lose oil pressure, which can destroy your motor. The CorkSport Stainless Braided Oil Cooler Lines replace the stock line with completely new and upgraded parts. The lines are a stainless steel braided line which is more durable than the stock oil cooler lines. They are a little more difficult to install because of how tough they are, but the end results and peace of mind you get knowing they won’t fail are well worth it. That’s all for this time, I will run through the drivetrain, chassis, and styling modifications in future blog posts. this is a great article for people who are new owners of rx7s, im sure it will help others. And i’m definitely getting corksports turbo inlet pipe, never thought much of the stock one till I read this! nice write derrick , no boost contr. though? And wont i need a boost controller also? Do you guys still make the Turbo Inlet Pipe? I purchased an 87 rx7 T-II in 1000 parts, and its had a “full corksport exhaust system” now that im assembling the exhaust i noticed im short a section. i have the muffler section, I have the section with 2 hangers at the flange and one straight threaded bolt/stud on the side and i have the down pipe what section of pipe would i be missing and can i still get that from you guys? Do you still make ANY of these parts? I’m not seeing a single one on the website. Hey guys. I was wondering if you guys ever plan on making these parts again? Would be super cool as it is hard enough to find genuine and good parts for these cars.